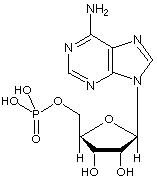 When RNA is broken down by living systems, nucleoside monophosphates, including adenosine monophosphate, are formed. 2 ADP + 2 Pi >2 ATP (this step is most often performed in aerobes by the ATP synthase during oxidative phosphorylation) AMP can be converted into IMP by the enzyme myoadenylate deaminase, freeing an ammonia group. AMP can also exist as a cyclic structure known as cyclic AMP (or cAMP). Within certain cells the enzyme adenylate cyclase makes cAMP from ATP, and typically this reaction is regulated by hormones such as adrenaline or glucagon. cAMP plays an important role in intracellular signalling. All text is available under the terms of the GNU Free Documentation License. Wikipedia is powered by MediaWiki, an open source wiki engine.